Tribal leaders in North Dakota have scrambled to print at least 3,500 new tribal IDs for Native Americans living on reservations in North Dakota in response to the state’s new voter ID law, the effects of which will be seen across the state for the first time on Tuesday. A federal judge recently denied the tribes’ request for a temporary restraining order to stop the new voter ID law, which requires North Dakotans to provide a state or tribal ID with a residential address in order to vote – a challenge for thousands of Native Americans living in rural communities on or near reservations -- from going into effect before Nov. 6. Though the law has been debated in various courtrooms for about two years, the U.S. Supreme Court allowed an earlier ruling that sided with the state to stay in October. Since then, the tribes have had to scramble to print thousands of new IDs with street addresses. Throughout Monday in Turtle Mountain, North Dakota’s most populous reservation, a steady stream of people made their way to the table to be registered and photographed. As of Monday afternoon, the number of IDs issued in Turtle Mountain alone had nearly doubled since Saturday, with 2,000 new tribal IDs issued to include physical addresses, according to Jamie Azure, Chairman of the Turtle Mountain Band of the Chippewa. Despite the effort, advocates for the tribes told ABC News they remain unsatisfied with the guidance on the issue coming from North Dakota’s secretary of state. 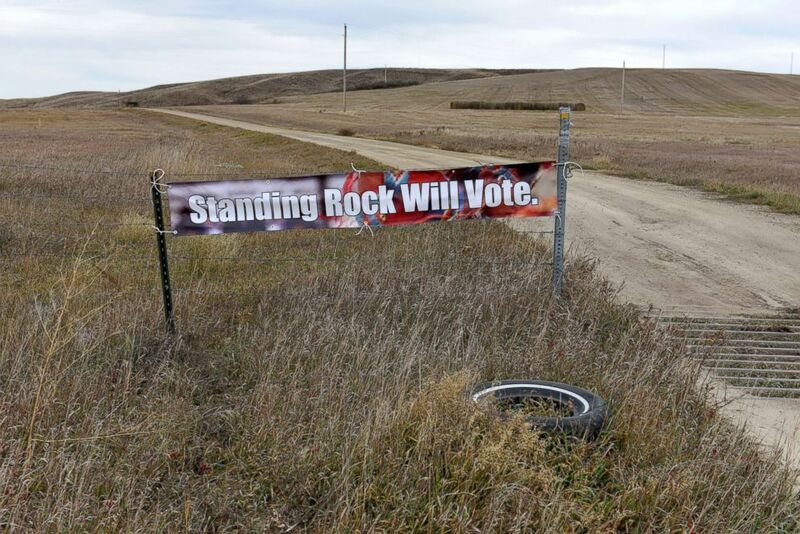 A banner encouraging tribal members to vote in the 2018 mid-term elections, is seen on the Standing Rock Reservation near Fort Yates, North Dakota, Oct. 26, 2018. North Dakota Secretary of State Al Jaeger told ABC News on Friday that Native Americans with newly issued tribal IDs with street addresses would be able to vote, but he didn’t directly address the concerns of the lawyers, instead suggesting voters “talk to local officials” and said poll workers would “most likely” will accept the IDs. Native American voters could prove to be an important part of North Dakota’s election, with more than 9,000 voter aged tribal members in Turtle Mountain alone. The new law comes amidst a closely-watched Senate race between incumbent Democratic Sen. Heidi Heitkamp and Republican challenger U.S. Rep. Kevin Cramer. 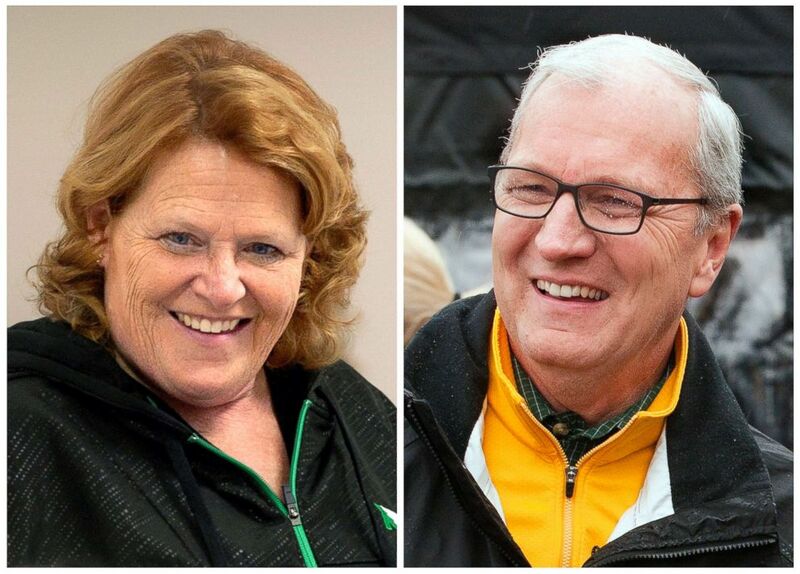 This combination of file photos shows North Dakota U.S. Senate candidates in the November 2018 election from left, incumbent Democratic Sen. Heidi Heitkamp and her Republican challenger Kevin Cramer. In 2012, Heitkamp won the election by just 2,936 votes – but won handily in the counties with the largest population of Native Americans. Heitkamp’s campaign plans to have attorneys at almost every polling precinct on each of North Dakota’s reservations on Election Day, ready to call the county auditor if any voters are turned away, according to Ryan Stroschein, a coordinator on the campaign who’s been working with Native American voters. Heitkamp’s campaign plans to keep in touch with any Native American voter who’s issued a set-aside ballot so they can follow up on their vote, but the campaign has no plan to engage in any lawsuits, Stroschein said. Speaking at a Senate debate, her opponent Cramer said that voting in North Dakota is "the easiest of anywhere in the country.” He added that the voter ID law is fair and that Heitkamp was playing "identity politics." "The standard is the same for all people, regardless of race, creed or color," he said. Although turnout is normally low on reservations, Azure believes this year’s midterm elections will be a record turnout because the tribes have united against those who he says have attempted to suppress his people’s right to vote. “They have woken a sleeping giant, ” he said.